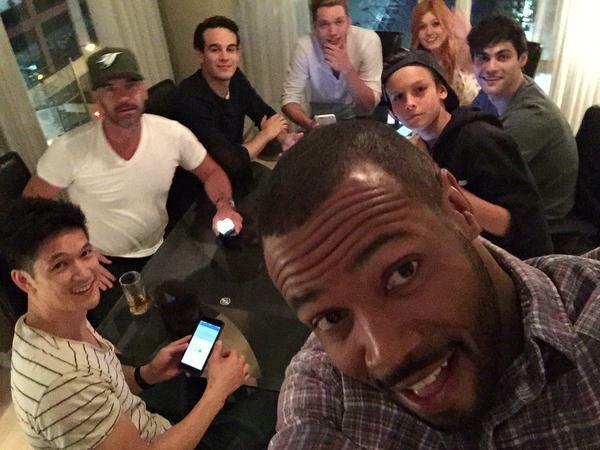 On Saturday night, the cast of Shadowhunters played a game of Werewolf and streamed it for our viewing pleasure. Thanks to the lovely Ana Carmen Mtz, you can now watch or watch again and again! Watch as Katherine McNamara, Dominic Sherwood, Alberto Rosende, Matthew Daddario, Harry Shum Jr., Isaiah Mustafa and Alan Van Sprang get intense in this completely confusing yet totally hilarious game that we so want to play! Gold. And then Dom was strangle-hugging him. Amazing. I love this game! It’s amazing, and they’re amazing for playing it aww! Who is that Logan kid? One of the cast’s siblings or just a random boy who somehow got in? Aha So fun! Glad they’re getting along and cannot wait for the show to premiere! This is hilarious. I laughed almost the entire time … Great cast, great team! That’s cool! Bonding. No attitudes. They look like totally cool and fun people. They are funny! That was hilarious! I would love to play with them! What version is this? The on eI play you kill people at each round until either the werewolves are all dead yay, or they kill everyone else and win. With characters like Oracle, Huntsman, Witch, Little Girl. Same kind of speculation and so much fun though! Omg !! The boy is Max ?!!! Ornot!? No, the boy is Alan Van Sprang’s son. Max Lightwood didn’t appear in City of Bones (the book). in the end, they were tricked by a mischievous Warlock! wink wink! hahaha! then dom strangled hugged matt, 🙂 BROTP! I am sorry but I have never seen Shadowhunters but I do think that Alan Van Sprang is the sexiest man alive.